Black and white negative of an unidentified newspaper clipping highlighting the the construction of the Toronto and Eastern Railway. Whitby Mayor, Norman Bassett, prepares to drive the first spike. E.W. Oliver (right), manager of the Canadian National Railway electric lines, holds the nickel plated spike. In the background Whitby and Canadian National Railway officials are assembled. The Toronto and Eastern Railway was built along Mary Street starting in 1913. Work was suspended during the First World War and resumed in 1923. The railway was never completed and the rails were torn up in 1927. It was intended to be a commuter railway from Toronto to Oshawa. 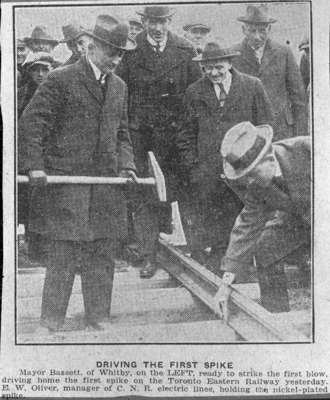 Driving First Spike for Toronto and Eastern Railway, October 31, 1923, Toronto Daily Star. Whitby Archives 14-003-001.